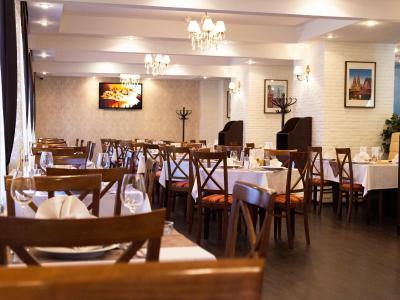 Lock in a great price for Maxima Zarya Hotel – rated 8.1 by recent guests! Friendly staff. Quiet location on a small beautiful street. Close to subway station. No excessive security checks in lobby (like in some other hotels). The hotel was close by two metro stops and made getting to different parts of the city very easy. The rooms were nice and clean, great value for the price! Staff was very friendly, particularly the receptionist. Located in quiet residential area of Moscow but close to Botanical Garden. Walking distance to metro station. Sister hotel Ibisa has nice private spa with Turkish bath and swimming pool. I ordered some food to be delivered to my room (I went to the restaurant because my phone didn't work). Forty-five minutes before it was to be delivered, my plans changed, and I canceled. After some discussion, they refunded my money. Location. Great restaurant with lots of options. Very clean and they accept all major credit cards including American Express, Mastercard, etc. Close to subway station about 5 mins of walk. Good and nice location. Pretty clean. Nice and polite stuff, each of them saying hi which is really cool. Good breakfast. If you add croissants to the breakfast menu you will be one of the restaurants where I will return very gladly! Place is to far from tourist center.. staff are indifferent with your needs,.they don't take messages for guess or if you received a phone call.. Very clean, conveniently located close to a metro station. Rooms are big. 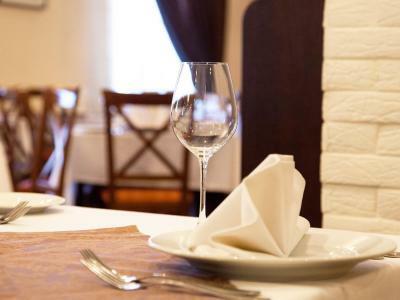 Maxima Zarya Hotel This rating is a reflection of how the property compares to the industry standard when it comes to price, facilities and services available. It's based on a self-evaluation by the property. Use this rating to help choose your stay! This hotel is close to Moscow's Botanical Gardens and combines affordable accommodations with a quiet setting. Free Wi-Fi is available. 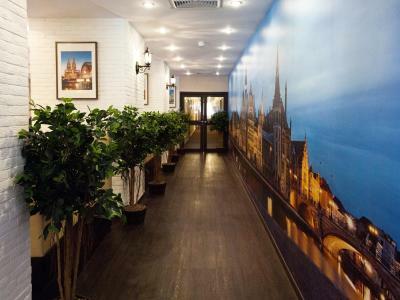 Maxima Zarya Hotel is only a short walk from the metro station, offering easy access to all areas of Moscow. The spacious guest rooms are comfortably furnished and have air conditioning, satellite TV and a work desk. 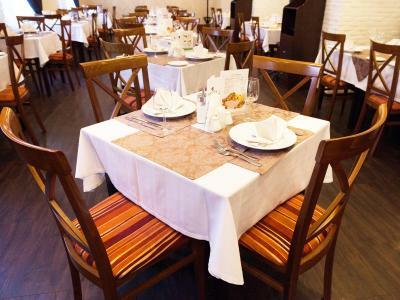 Maxima Zarya has its own restaurant and the lobby bar is open 24 hours per day, providing an ideal meeting place. Moscow's Count Sheremetyev's Palace is a 10-minute walk from Maxima Zarya. The All-Russia Exhibition Center is just a 10-minute drive away. Sheretetyevo International Airport can be easily reached in 22 minutes by Aeroexpress Train. Marfino is a great choice for travelers interested in parks, museums and convenient public transportation. 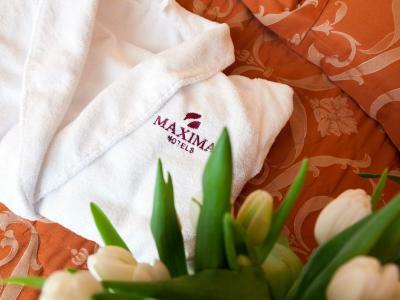 When would you like to stay at Maxima Zarya Hotel? No extra bed can be added to this room. Private parking is available on site (reservation is not needed) and costs RUB 200 per day. Spacious studio with a queen bed, a sitting area and a flat-screen TV. This spacious room includes twin bedding, a sitting area and a flat-screen TV. Classic-style room with a minibar. Hotel surroundings – This neighborhood is a great choice for travelers interested in parks, museums and convenient public transportation – Check location Good location – show map Guests loved walking around the neighborhood! House Rules Maxima Zarya Hotel takes special requests – add in the next step! Any additional children or adults are charged RUB 1000 per night for extra beds. Maxima Zarya Hotel accepts these cards and reserves the right to temporarily hold an amount prior to arrival. After booking, the charges for providing visa support have to be arranged with the hotel directly. Please note that once arranged, the visa support cannot be canceled without a charge. According to the hotel's policy the guest who made the booking must be the owner of the credit card provided during the booking and at check-in. A special permission along with a photo-copy of the card must be provided by guests who do not own the card. Please note that smoking is prohibited throughout the hotel. Very loud staff who woke me up early in the morning. Housekeepers room was just opposite to my room 458, so every morning they were discussing smth and laughing loudly. The room was not well isolated. Could hear other residents at the morning, but this is also up to their behaviour and respect to other people's rest. Lunches could be better...didn't like soups. Dust on TV and lamps- please check them also when clean. A bit shabby interior, but no problem with that. The reception counter is too small and there's not enough room in the lobby when lots of people are trying to check in. It is relatively away from the city center. However there are public transport within reach. The room was smelly with old carpet smell and smoke. No ventilation or air conditioning in the room. The pool was not free. The room was very hot. The location is terrible. From Belorusskaya, I rode to Voikovskaya, then walked 15 minutes to the Moscow Central Line. I rode to Okryshka and then walked 20 minutes to the hotel. I ordered a taxi from the hotel--I was thinking that this would more expensive to have the hotel order it, but I didn't know it was so expensive. I paid the hotel 1000 rubles. They paid the taxi driver 360. Thank you very much Maxima, I won't be seeing you again. Needed air conditioning in the room to help sleep during such a hot summer. Room was a bit smaller than expected, with some silverfish problems in the bathroom, and inaccessible power sockets. Also, for some reason, male staff were extremely rude. I forgot a gift for my wife in the room. They returned the package but the dress was replaced. Instead of a red silky one, there was a white cheap dress. Now, I'm trying to get it back by escalating and writing emails.